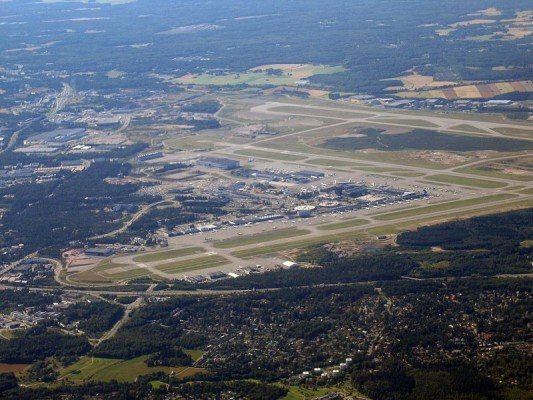 The Safety Investigation Authority Finland published the final report of their investigation into a serious separation infringement incident at Helsinki-Vantaa Airport involving three passenger flights in 2013. The serious incident occurred near Helsinki-Vantaa Airport on 6 February 2013 at 16:07. Flybe Finland flight FCM746L from Warsaw (Embraer ERJ-190 OH-LKO) and British Airways flight BAW79H (Airbus A319 G-EUUK) from London were arriving at Helsinki-Vantaa. At the same time Scandinavian Airlines flight SAS717, operated by Blue1 (Boeing 717 OH-BLQ), was departing from Helsinki-Vantaa for Stockholm. At the time of the occurrence Helsinki-Vantaa had segregated parallel operations in use. Runway 04L was used for arrivals and RWY 04R for departures. It was snowing and visibility varied. FCM746L, an Embraer 190, and BAW79H, an Airbus 320, were flying instrument approaches to RWY 04L. When BAW79H was at approximately 4 NM from the threshold of RWY 04L the arrival controller told it to go around because its distance to the preceding FCM746L on the approach decreased below the required minimum separation. Soon after this the flight crew of FCM746L, too, decided to go around because the TWR controller had not issued them a landing clearance, as the aircraft that landed before them was still on the runway. The minimum distance between the aircraft going around was 1.5 NM (2.8 km); both of them were flying at 3000 ft (900 m). In accordance with the heading issued by the arrival controller BAW79H turned to the left and the distance between the two aircraft began to increase. Simultaneously, as FCM746L was aborting its approach to RWY 04L, SAS717, a Boeing 717, took off from adjacent parallel runway 04R. The TWR controller cleared FCM746L to turn right heading 050, and a little later to 040 degrees, i.e. on the runway heading. The aircraft flew abreast of each other in the same heading for one minute and ten seconds; the distance between them was 0.9 NM (1.7 km). FCM746L was maintaining 3000 ft (900 m) and SAS717 was in an initial climb to 4000 ft (1200 m), as per the Standard Instrument Departure. During its climb SAS717 passed through the altitude FCM746L was maintaining. The minimum radar separation for the area of responsibility of Helsinki-Vantaa ATC is 3 NM (5.6 km). The minimum vertical separation is 1000 ft (300 m). The required separation minima were clearly infringed in both of the aforementioned instances. Radar recordings showed that the ATC system warned the air traffic controllers of potential collisions between the aircraft by annunciating STCA alerts. The air traffic controllers did not adequately react to the alerts. The serious incident involving the flights of British Airways and Flybe Finland developed when the arrival controller issued a clearance to the British Airways flight which took it almost directly above RWY 04L. For this reason the Flybe Finland flight no longer had sufficient airspace for flying a missed approach procedure in accordance with the instrument approach chart. The TWR controller cleared the Flybe Finland flight, flying a go-around, to maintain the runway heading. While issuing this clearance the controller did not notice the Scandinavian Airlines flight that had departed from RWY 04R, which in turn caused the serious incident involving the flights of Flybe Finland and Scandinavian Airlines. Contributing factors included the arrival controller’s delayed decision-making in an untypical traffic situation, the TWR and APP controllers failing to prioritise their tasks, and shortcomings in coordination between the controllers’ working positions. On the basis of the investigation Safety Investigation Authority, Finland issued four safety recommendations to Finavia Corporation: three of them concern the Helsinki-Vantaa ATC Ops Manual and one the use of the Surface Movement Radar system. Safety Investigation Authority, Finland recommends that the Helsinki-Vantaa ATC Ops Manual be augmented with an operational instruction for controllers in case the STCA system annunciates an alert. The instructions related to missed approaches and non-standard go-around clearances must be made more detailed and comprehensive. The instructions on segregated parallel opera-tions must be augmented with regard to when the criteria of segregated parallel operations are no longer met. When it comes to the use of the Surface Movement Radar (SMR), the recommendation to Finavia Corporation entails taking measures which make it possible to use the SMR in establishing that the runway is free when aircraft are being cleared onto the runway.